My Sweet Haven: My Permanent Resident Card arrives today!!! Have I just been lucky or is USCIS California just faster than any other service centers? Four days after I got an email with regards to my AOS approval, I received two letters in our mailbox from USCIS California. One of it is a Welcome to the US letter and the other one which surprised me the most is my Permanent Resident Card. I was thinking of 60 days after the email notice, thus it made me so happy and excited when I got a hold of my card today. The card expires in 2 years and so we have to renew it 90 days before it expires. It's not bad, I mean at least we can rest from the immigration process for 2 years. Right now, I've got a driver's license and a permanent resident card. I feel that this is the best time for me to start my life outside the house, get a job and legally reside in the US. This is fun and I am jubilant!!! wow,congratulations,dear!!! 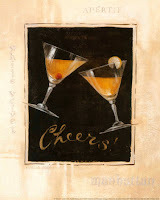 !let us have a "cheers" for that! I appreciate you sharing. Salamat kaayo. wow! yehey! congrats Jhenn... mine arrived both... I got them the same day the same date, magkasama all along ang notice of approval ang my green card ko, yehey! let's celebrate for that! congrats! i just had my biometrics for my 10 yr. GC. can't wait to get my card soon.